A new lung adenocarcinoma classification proposed by the International Association for the Study of Lung Cancer, American Thoracic Society, and European Respiratory Society (IASLC/ATS/ERS) has recently been published. This study aimed to investigate the utility of the new histological classification for identifying the prognostic subtypes of adenocarcinomas in stage IB patients.Correlations between the classification and the presence of epidermal growth factor receptor (EGFR) mutation status was also studied. One hundred and thirty-six patients with stage IB lung adenocarcinoma operated on in Zhejiang Cancer Hospital were identified between 2002 and 2011. Patients overall survival and disease-free survival were calculated using Kaplan-Meier and Cox regression analyses. EGFR mutations were detected using the amplification refractory mutation system. A total of 136 cases were included in current study, of which 38 were papillary predominant, 39 were acinar predominant, 22 were micropapillary predominant, 21 were lepidic predominant subtypes, 14 were solid predominant, and 2 were variants of invasive adenocarcinoma. Patients with micropapillary- and solid-predominant tumors had the lowest five-year disease-free survival (28.4 and 36.7%, respectively). Univariate and multivariate analysis showed that the micropapillary-predominant subtype was an independent predictor of disease-free survival (P = 0.0041 and 0.048, respectively), but not overall survival (P = 0.175 and 0.214, respectively). EGFR mutations were significantly associated with the micropapillary-predominant subtype patients (P = 0.0026). The EGFR mutation frequency is lower in the solid-predominant subtype than other subtypes (P = 0.0508). The predominant subtype in the primary tumor was associated with prognosis in resected stage IB lung adenocarcinoma. The EGFR mutation frequency of micropapillary-predominant subtype is higher than other subtypes. Lung cancer is theleading cause of death in cancer patients worldwide . The incidences of stage I non-small cell lung cancer (NSCLC) has increased recent years. However, recurrence and metastasis is a great challenge in these patients. The five-year survival rates of patients with resected stage I NSCLC is about 60% . There is a great need to predict which patients will recur in order to develop strategies for choosing which patients may benefit by adjuvant treatment. According to the 2013 National Comprehensive Cancer Network Clinical Practice Guidelines in Oncology for NSCLC, stage pathologic tumor node metastasis (pTNM) IB (tumor size more than 3 cm and less than 5 cm or pleural involvement) patients with complete resection are treated with observation except for the patients with high risk factors such as lymphatic and/or vessel invasion, pleural involvement, and a tumor size of more than 4 cm. However, there is some dispute in this setting. A new lung adenocarcinoma classification proposed by the International Association for the Study of Lung Cancer, American Thoracic Society, and European Respiratory Society (IASLC/ATS/ERS) has recently been published . Many researchers have attempted to implement a more meaningful pathological classification which could provide prognostic and molecular biology information with relevance to clinical behavior [4–7]. Epidermal growth factor receptor (EGFR) mutations have been recently discovered and EGFR- -tyrosine kinase inhibitor (TKI treatment has been played an important role in treating advanced NSCLC, especially for EGFR mutation patients [8–10]. The frequency of EGFR mutation has proven to be more common in adenocarcinoma . However, the relationship between the EGFR mutation and the subtype of the new lung adenocarcinoma classification is not clear. This study reviewed a series of consecutive patients with stage IB NSCLC who had been operated on in a single institution according to the new IASLC/ATS/ERS classification.It tracked the relationship between the predominant subtype of adenocarcinoma and prognosis, in addition to detecting the Correlation between the new subtype ofadenocarcinoma and EGFR mutations. A total of 136 adenocarcinoma patients with pathologic stage IB NSCLC, who underwent complete resection between January 2002 and December 2011, were identified in Zhejiang Cancer Hospital. The Ethics Committee at Zhejiang Cancer Hospital approved the study. All patients underwent complete resection of lung cancer. Histological typing was determined as adenocarcinoma according to the 2004 World Health Organization classification. Lung cancer staging was performed for all patients according to the seventh tumor node metastasis (TNM) staging classification. All of the patients did not receive preoperative chemotherapy or radiation therapy. All resected specimens were formalin fixed and stained with hematoxylin and eosin in the routine manner. Each of the slides was examined independently by three specialists. The average number of slides from each case reviewed in our study was 11.5 (range: 1 to 35). Histological classification was according to the IASLC/ATS/ERS classification of lung adenocarcinoma and the 2004 WHO classification. According to the IASLC/ATS/ERS criteria, each tumor was reviewed using comprehensive histologic subtyping, recording the percentage in 5% increments for each histologic component. Tumors were classified as adenocarcinomas in situ (AIS), minimally invasive adenocarcinomas (MIA), and invasive adenocarcinomas. Adenocarcinomas were further subdivided into lepidicpredominant (Lepidic), papillarypredominant (Pap), acinarpredominant (Aci), micropapillarypredominant (MP), solidpredominant (Solid), invasive mucinous adenocarcinoma and others (including colloid adenocarcinoma and fetal adenocarcinoma). The predominant pattern is defined as the pattern with the largest percentage. Molecular analysis of EGFR was performed using the amplification refractory mutation system (ARMS) with formalin-fixed paraffin embedded archival tissue blocks obtained during surgical excision of the tumors. The examination method followed was that of Lynch et al. . Patients were examined at three-month intervals for the first two years and at six-month intervals thereafter. The follow-up evaluation included a physical examination, a computed tomography scan of the chest and abdomen, brain magnetic resonance imaging, and bone scintigraphy. The last follow-up date was 31 May 2013. The median survival time from surgery to the last censoring date was 74 months (range, 21 to 145 months). The clinicopathologic characteristics of the patients are listed in Table 1. The median age of the patients was 57.6 years in the current cohort. Of the136 patients, 103 patients were never smokers and 33 were former or current smokers. Of the 136 invasive adenocarcinoma cases, 38 were papillarypredominant, 39 were acinarpredominant, 22 were micropapillarypredominant, 14 were solidpredominant, 21 were lepidicpredominant subtypes, and 2 were variants of invasive adenocarcinoma (Table 1). A total of 12 specimens showed a single pattern, whereas 32 displayed two, 54 displayed three, and 40 displayed at least four patterns. Two patients were variants of invasive adenocarcinoma (colloid adenocarcinoma). Table 2 shows the results of the univariate analyses of the clinicopathologic and histologic factors evaluated in this study. The five-year disease-free survival rate (DFS) and overall survival rate (OS) for the all patients were 52.4 and 62.0%, respectively. Lymphatic and/or vessel invasion, micropapillary-predominant subtype, and solid-predominant subtype correlated significantly with a worse DFS (P = 0.045, P = 0.041, and P = 0.049, respectively), although these were not significantly different for OS. There was a significant difference between different histologic subtypes for DFS but not for OS (Figures 1, 2 and 3). DFS, disease-free survival rate; OS, overall survival rate. Probability of disease-free survival and overall survival between lepidic-and solid-predominant subtype. A Probability of disease-free survival comparison between lepidic-and solid-predominant subtype (P = 0.014). B Probability of overall survival comparison between lepidic- and solid-predominant subtype (P = 0.031). Probability of disease-free survival and overall survival between lepidic- and micropapillary-predominant subtype. 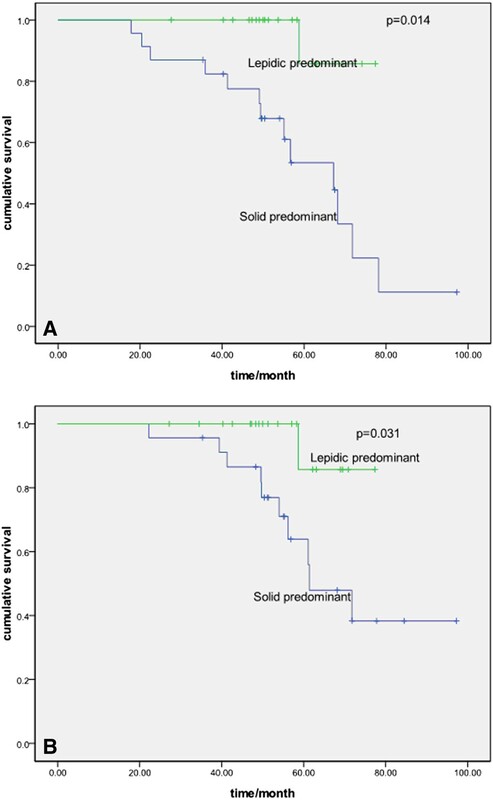 A Probability of disease-free survival comparison between lepidic- and micropapillary-predominant subtype (P = 0.001). 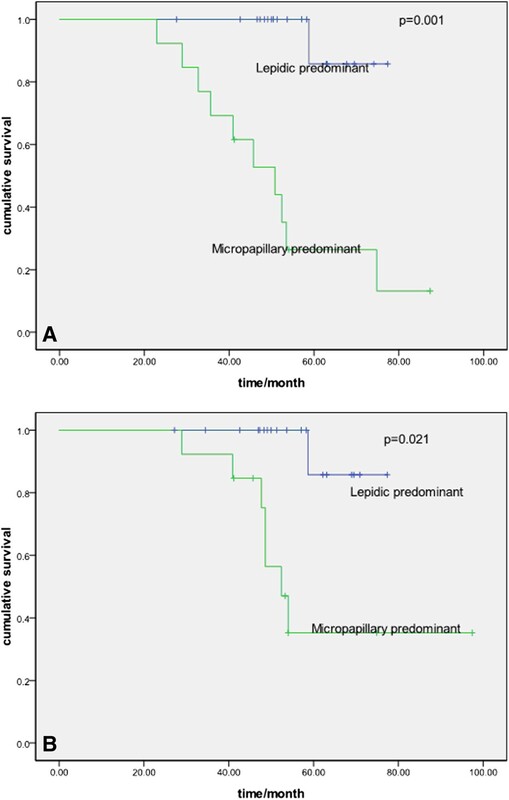 B Probability of overall survival comparison between lepidic- and micropapillary-predominant subtype (P = 0.021). Probability of disease-free survival and overall survival between acinar- and papillary-predominant subtype. A Probability of disease-free survival comparison between acinar- and papillary-predominant subtype (P = 0.814). 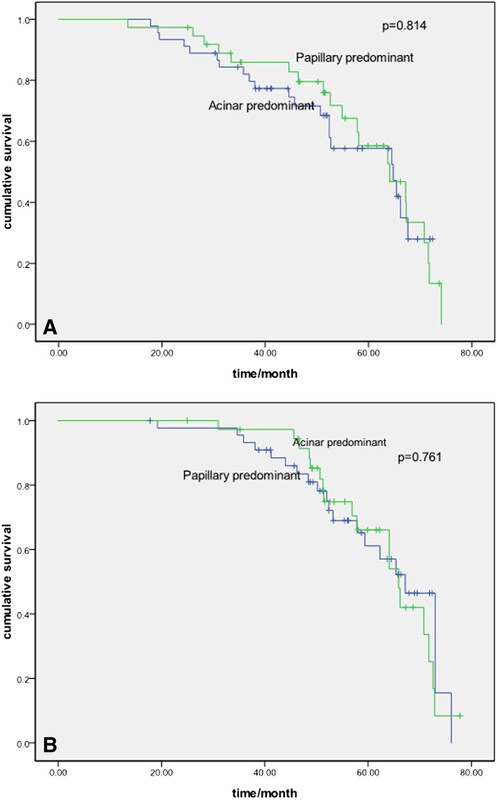 B Probability of overall survival comparison between acinar- and papillary-predominant subtype (P = 0.761). A multivariate Cox’s regression model was constructed considering lymphatic and/or vessel invasion, micropapillary predominant, solid predominant, and lepidic predominant as variables. Micropapillary predominant qualified as an independent prognostic factor for DFS but not OS (Table 3). DFS, disease-free survival; OS, overall survival. A total of 102 out of 136 patients provided tumor samples for EGFR mutation analysis. EGFR mutations were identified in 39 (38.2%) patients (22 with exon 19 delete and 17 with exon 21 L858R mutation). There was a significant difference among the patients with EGFR mutation frequency between the micropapillary-predominant subtype and other subtypes (P = 0.0026). In contrast, EGFR mutations were less frequent in the solid-predominant subtype than in the other subtypes (P = 0.0508) (Table 4). There was no significant difference between other subtypes and EGFR mutations. In the presented study, the data indicated that the IASLC/ATS/ERS histologic subtypes of lung adenocarcinoma could predict the prognosis of stage IB patients. EGFR-mutated tumors were more likely to be of the micropapillary-predominant subtype and were less frequent in the solid-predominant subtype. The prognostic impact of the new classification on recurrence has been validated in several studies [13, 14]. Yoshizawa et al. reported that the IASLC/ATS/ERS histologic classification was predictive of prognosis in stage I adenocarcinoma. Their data revealed that AIS and MIA had a 100.0% five-year DFS. Lepidic predominant, papillary predominant, and acinar-predominant subtypes had a 90.0%, 83.0%, and 84.0% five-year DFS, respectively. In the study by Hung et al. , the lepidic-predominant adenocarcinomas had a lower risk of recurrence, whereas micropapillary- and solid-predominant adenocarcinomas had a higher risk for recurrence. In our study, the lepidic-predominant adenocarcinomas were shown to have a better prognosis compared with other subtypes.The micropapillary- and solid-predominant adenocarcinomas had the worst prognosis, which is similar to the results from the Hung et al. study . The prognostic value of the new classification on OS has also been researched in several studies [4–7, 13, 14]. Micropapillary- and solid-predominant adenocarcinomas showed poor OSwhen compared with other subtypes in the Song et al. study . However, no survival difference for post-recurrence was identified among different subtypes in the Hung et al. cohort study . In our cohort study, no difference was found in thefive-year OS between different histology subtypes in univariate and multivariate analyses, which may due to the different treatment after recurrence or metastases, such as EGFR-TKI therapy. The relationship between EGFR mutations and predominant subtype has been examined in several studies [16, 17]. The data between the EGFR mutation and histology subtype are conflicting. Zhang et al. investigated 349 lung adenocarcinoma cases and found EGFR mutations were more frequent in acinar-predominant tumors. However, EGFR mutations were found to be more frequent in micropapillary-predominant tumors in the Shim et al. and Song et al. studies [16, 18]. Our results showed that EGFR mutations was more frequent in micropapillary-predominant subtypes (P = 0.0026). The different outcome between EGFR mutations and histology subtypes may be related to study sample size and ethnic difference. Our study’s major limitations were being retrospective and from a single institution. In addition, EGFR mutation data was not available for all of the patients, thereby limiting the inferences possible from our clinical study. However, with the small number of patients in clinical trials, our retrospective study is still meaningful. In conclusion, we have demonstrated the prognostic value of the new classification in stage IB lung adenocarcinoma patients. This new classification might be valuable for detecting patients with a high risk of recurrence in order for them to receive postoperative adjuvant treatment. EGFR mutations were found more frequently in micropapillary-predominant tumors in this study. YS and XY cooperated in the conception and design of the study, and in the collection of the data; JZ,XS and WH validated all pathology reports, and assisted in data analysis and interpretation of data; YS drafted the manuscript. All authors approved the final manuscript.